When I try to look for a movie to watch on Netflix and iTunes, I always find it overwhelming. The sheer number of films available is incredible - most I have never heard of. That's one of the reasons I write down suggestions from others whenever possible. If I don't write it down, it gets forgotten. One day my friend Talon suggested a movie that sounded intriguing. I didn't write it down and was considering emailing again for the suggestion. 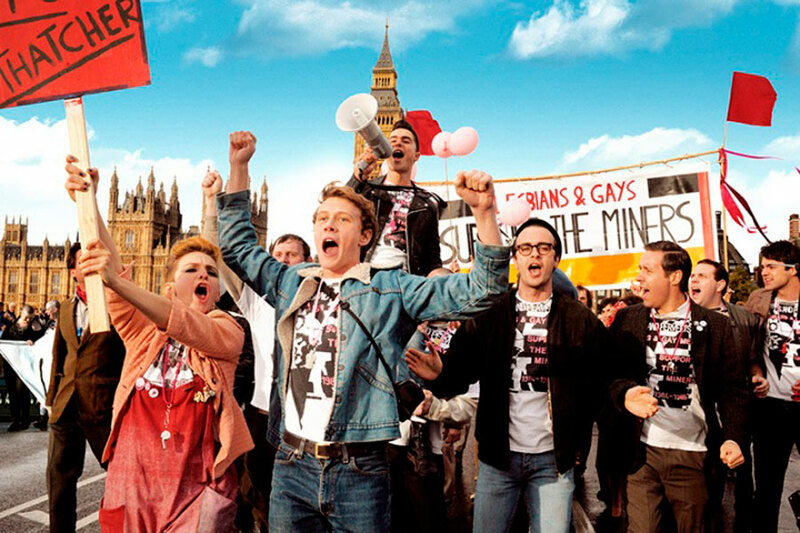 But low and behold when I was exploring the latest additions to Netflix last week looking for something for our Sunday dinner and a movie night, there it was - Pride (2014). Everyone else wasn't sure, but I was pretty firm and it was my week to choose. Great casting, great acting, great pacing and an amazing story.......we all loved it. 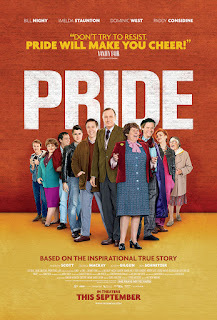 PRIDE (2014) is listed as a Drama, Comedy - Dramedy for serious movie fans - and that's a very accurate description. It never goes too deep into despair - with lighter moments scattered throughout - but you never lose the seriousness of the subject matter. The pacing between high and low moments is bang on. You're never left anywhere too long, but you don't feel rushed. The movie is two hours long, but the story carries that time easily. Rotten Tomatoes ratings show 92% for Critics and 89% for audiences. Kudos to director Matthew Warchus and writer Stephen Beresford. 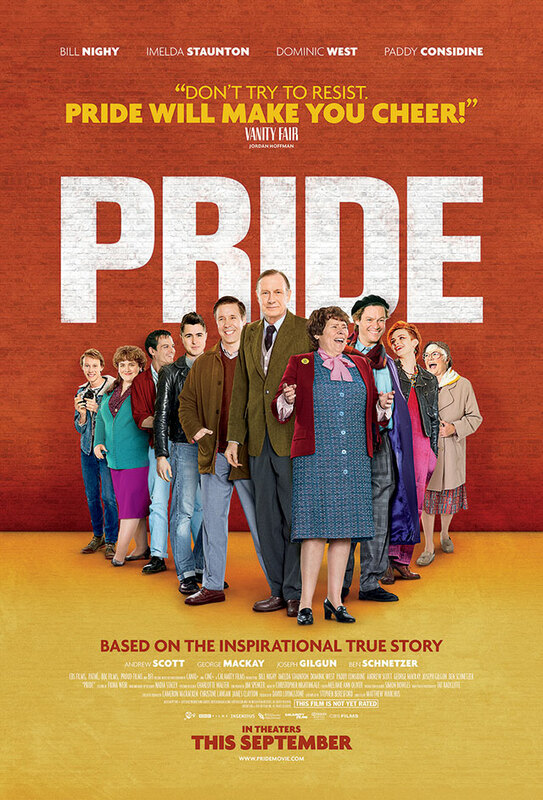 Description from the movie press release - "PRIDE is inspired by an extraordinary true story. It's the summer of 1984, Margaret Thatcher is in power and the National Union of Mineworkers is on strike, prompting a London-based group of gay and lesbian activists to raise money to support the strikers' families. Initially rebuffed by the Union, the group identifies a tiny mining village in Wales and sets off to make their donation in person. As the strike drags on, the two groups discover that standing together makes for the strongest union of all." I would suggest one thing before watching, especially if you're younger. Try to place yourself in 1984 in England. It's the time of Margaret Thatcher and the miner's strike. It was an ugly event in Britain's history. Also try to put yourself back to where gay right's were at the time. It's so easy to forget, despite the change still needed, the serious prejudice that existed then and the lack of safety for members of the LGBT community. Both of these issues are intertwined in this film and understanding them lets you embrace the beauty and hope in this story better. From prejudice, to breaking down walls and discovering the humanity in others, to stepping into another's world - PRIDE is a wonderful journey in the power of the human spirit to create change one small step at a time. I am definitely going to have to watch this one again.